Quick-cooking shrimp are simmered in a flavorful coconut curry sauce in this easy one-pot recipe that's perfect for bust weeknights. Ready in under half an hour, the curry is a simple yet aromatic mixture of coconut milk, curry powder, onion and garlic, refreshed with a hit of fresh lime juice. Chopped green cabbage is cooked until just wilted, and adds texture as well as dietary fiber and potassium. Don't forget the toppings! Toasted peanuts and cashews add crunch, while fresh basil and cilantro leaves are a refreshing contrast to the creamy sauce. 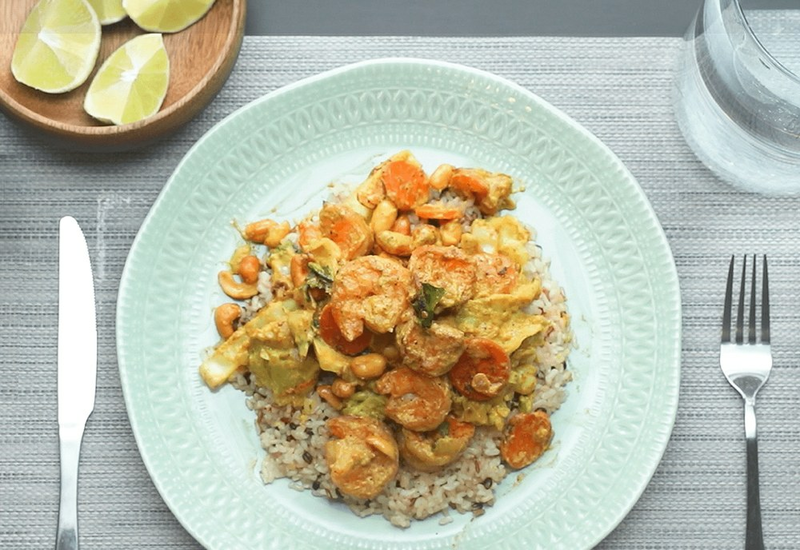 Curries are often served over rice, but for a healthier take, serve this recipe over riced cauliflower or spiralized noodles to limit the carbohydrate count while also increasing the vegetables. Not a fan of shrimp? Use cubed chicken or white fish filets for an equally delicious result. Per Serving: 575 calories; 39g fat; 29.1g carbohydrates; 34g protein; 239mg cholesterol; 1353mg sodium. I loved this dish!!! It came together in 15 minutes (as long as it took the rice to cook!) The amount of curry is perfect! Be sure to fork test the carrots before adding the shrimp back in. I served mine over rice with peanuts and it was amazing!!! There was a little too much lime zest in this for me. Also, the carrots were a little too crunchy for my taste. It turned out delicious. I only zested one lime and it was a good amount of zest. I skipped the lime zest after reading some of the other comments, and I it turned out well. I also added an extra tablespoon of honey and skipped the carrots all together. I thought it was tasty, but next time I will probably add water chestnuts or something for crunch. Basil is a must for this recipe! I didn't add nuts or cilantro, but did top it off with some hot sauce. Not traditional, but I like mine extra spicy.